Choose what size pan to use depending on how large you’d like your pizza to be. I like to use a non-stick pan as it’s easier to get the melted cheese off of at the end. I use a small pan and do personal-size pizzas. Cover the bottom with the shredded cheese, enough so that you can barely see the bottom of the pan. Cook on medium until it starts to bubble. Add your toppings largest to smallest, as the largest need a little more time to incorporate into the pizza. 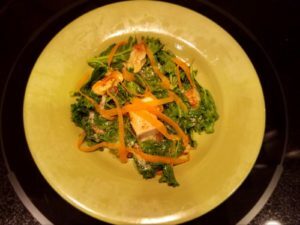 I added my chicken bites first, then the kale (which I just shredded as I took off the stem), and the carrot bits last. Wait another minute or two until it all seems to be together. Use a spatula to lift the edges off the pan a bit. Once golden brown underneath, it’s done! Feel free to use pizza sauce - or whatever sauce catches your fancy - to dip. I love to use veggies because the cheese and stovetop cooking helps make them a bit sweeter. Don’t worry if it doesn’t come out of the pan as a circle, it’s delicious even if it folds in on itself a bit, and I like to eat with a fork in any case. Hope you enjoy as much as I do!